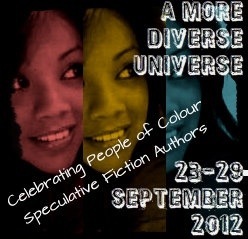 I’ve been looking forward to participating in the A More Diverse Universe project, and to using the opportunity to review two works by authors I’ve recently discovered who have greatly expanded my interest and appreciation of speculative fiction. In the past few months I’ve become a big fan of both Ted Chiang and Victor Lavalle, and if you haven’t read either, you should correct that oversight immediately. 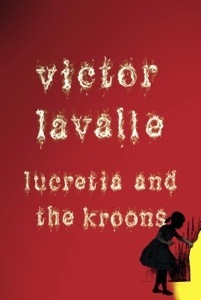 Lucretia and the Kroons is a novella set in the same world as Lavalle’s recent novel The Devil in Silver, showing us how Loochie Gardner eventually came to see a greater darkness in the world. Loochie is a normal twelve year old, dealing with the reality of her best friend wasting away from cancer. This is hard for her, as it would be for any child, especially as she sees Sunny as her only friend, and when Sunny’s gone she feels very small and alone. When she fears Sunny has been taken into the apartment of the Kroon family, crackheads who live above them in their Queens apartment building, Loochie feels her only choice is to go up after her. Lavalle’s book adopts the shape of a fairy tale, but one informed by his own childhood in Queens. Loochie’s fairy land is distinctly urban (the old World’s Fair Unisphere is a place of safety, rats with pigeon’s wings threaten her), but no different beneath that surface than Baum’s Oz. This land tests her, and forces her to accept realities she would rather ignore. Where Victor Lavalle really impresses, though, is his voice as a writer. He writes in that narrow channel where the cadence of his writing feels like the rhythms of his own speech, and reading him feels like listening to him. It’s a rare talent, and draws you into the story much deeper than you expect. 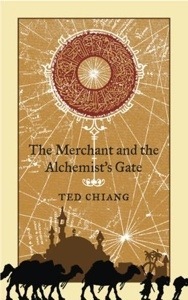 Ted Chiang’s The Merchant and the Alchemist’s Gate is a much different type of story, one set not in Chiang’s heritage as an Asian American, but instead in Iraq and Egypt hundreds of years ago. The story is four interlocked stories. The frame story is the titular merchant relating his experience of meeting an alchemist who has created a portal allowing a man to travel either backwards or forward in time. The Alchemist then tells of three people who used his gate to try and change their fortunes, with varied results. This inspires the merchant to use the gate himself. There isn’t much in the way of details I would want to give here, because the joy of this book is the surprising twists Chiang reveals throughout. Ted Chiang is receiving a lot of attention over his imaginative Science Fiction, and all of it is deserved. He delves into brain bending concepts fearlessly, and brings heady philosophical concepts into his writing to boot. Where Victor Lavalle uses a warm, intimate writing style, Ted Chiang is more analytical. Even with that difference, both are powerful, moving storytellers, and strong representatives of the rich diversity available in the worlds of speculative fiction. I really need to read these books now. Great post. I have Victor Lavalle’s newest on my TBR and this makes me even more eager to read it. I’ve never heard of Ted Chiang, but I’ll keep an eye out for his novels now. Thanks for this. I know of Chiang’s work and love The Merchant at the Alchemist’s Gate but had not heard of Victor Lavalle before. Am adding Lecretia and The Devil in Silver to mt TBR list. Lucretia and the Kroons is such a great story. I didn’t know what to expect when I first read it, but was really surprised. I’m going to give Chiang’s work a try. Cool! Speculative fiction and I have had a rocky relationship. Chiang’s book sounds very intriguing and more like what I want out of spec-fic. Thx. I’ll definitely add both of these to my wish list. Great reviews! Thanks, and thanks for coming up with this challenge, it’s one I’ll definitely do again next time around! I hadn’t heard of either of these before either. They sound intriguing. I’ve read a few of Chiang’s short stories and I really like his style. I will go forth and add The Merchant and the Alchemist’s Gate to my list–I am always on the look out for time travel, so thanks for bringing it to my attention! I don’t think I’ve come across either of these titles so I’m glad you’ve posted about them. Both sound brilliant and I will be checking them out in the near future! I haven’t read either (but I do have a collection of Chiang’s stories on my shelves), so thanks for nudging them both onto/up my TBR list. Mikel has read 7 books toward his goal of 52 books. Enter your email address to hear about new posts.